These knit potholders are fun to felt and are a great way to practice some new knitting skills. 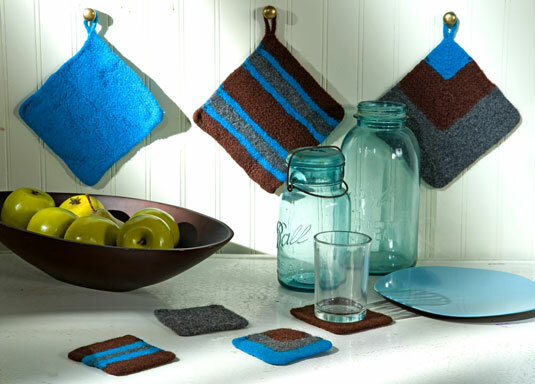 Knit these potholders and felt them to add pizazz to any kitchen. With color 3, cast on 64 sts, placing a marker in the center of the row between the 32nd and 33rd sts. Row 2 (RS): Knit to 2 sts before the marker, k2tog, slip marker, ssk, knit to the end of the row. Repeat these 2 rows 5 more times for a total of 12 rows. Switch to color 1 and work Rows 1 and 2 10 times. Switch to color 2 and continue repeating Rows 1 and 2 until there are only 2 sts left. Place the remaining st on your crochet hook and make a chain about 5 inches long. Slip stitch through the last knit stitch to form a loop. To felt, place your potholders in a zippered pillowcase or lingerie bag and run it through the washing machine along with a pair of jeans for added agitation. Set the machine for a hot wash and a small load. You may need to run the wash cycle more than once to felt your items completely. When the potholders look like felt and measure about 7 inches square, remove them from the washer. They may need to be wrestled into shape, but you can’t hurt them, so be rough if you need to. Allow the potholders to dry thoroughly before using them.